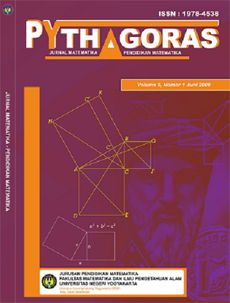 PYTHAGORAS: Jurnal Pendidikan Matematika is a scientific journal in the field of mathematics and mathematics education published in June & December. Pythagoras is licensed under a Creative Commons Attribution 4.0 International License. Based on a work at http://journal.uny.ac.id/index.php/pythagoras.